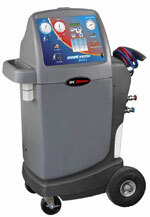 The Cool-Tech 34134Z recovers, recycles, evacuates, and recharges R-134a refrigerant quickly and accurately. Pressure feed system provides continuous lubrication. Variable power control in forward and reverse. Increased durability, quieter operation, and more comfortable handle contour. 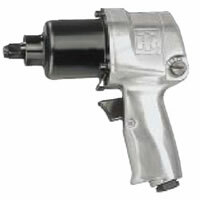 Bring out the “big gun” for tire-changing, shock and spring work, front end work, and other heavy automotive and truck work. The Twin Hammer impact mechanism pumps out 500 ft.-lbs. 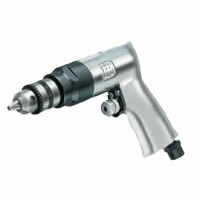 torque at a free speed of 7,000 rpm to get the job done fast. Powerful, with smooth, balanced blows. Good control: excellent balance and a variable speed trigger. More horsepower for extra torque output. Pressure Feed Lubrication System automatically greases the impact mechanism. 7-vane motor delivers 1,000 ft.-lbs. of Nut Busting Torque and 700 ft.-lbs. of traditional torque output. With its industrial grade 3/8" chuck, this economical choice includes high quality features for general drilling and hole sawing jobs. The planetary gear reduction balances the load on bearings and gears for increased tool life. 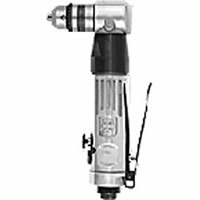 Here's the economical choice for power, a high quality air drill designed for drilling, hole sawing, cylinder honing, and any other job that calls for a ½" size. It's quality features for long life, include the industrial grade ½" chuck, ball and needle bearing construction, and double reduction planetary gearing..
No-load speed of 500 rpm. 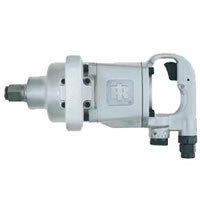 for service work requiring a compact, low profile angle head. 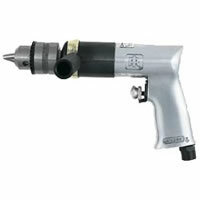 It's a durable, reliable tool for drilling in all types of materials, including sheet metal, wood, and composites. Tremendous power and longer life make this wrench the popular choice of professional mechanics for exhaust systems, air conditioning, radiators, body shop, and bench work. 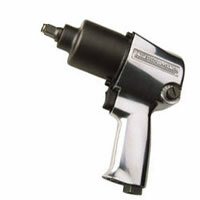 Still the most powerful 3/8" pistol-grip on the market, it offers all the advantages of the Single Hammer impact mechanism for removing and replacing bolts up to 7/16" without a struggle. 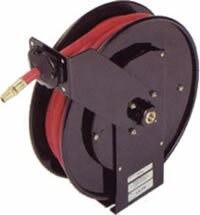 For applications where shorter,low volume hoses are used such as auto-truck service garages. 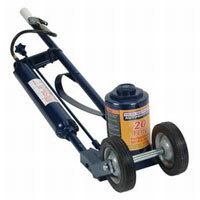 For all air applications as well as anti-freeze, motor oil.ATF and grease. Single set screw to access spring casing. Drive spring mechanismlubricated for life . One piece combination latch,spring arbor,main bearing and spool support for fewer moving parts. Brass swivel reduces corrosion potential. Lock-off throttle to prevent accidental start up. Rear exhaust directs air away from workpiece. Built-in regulator matches speed to job. 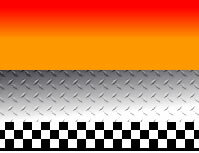 Applications: tire patchwork, roughing areas for recapping and cleaning tire moldings. 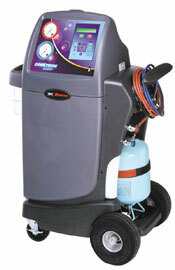 The Cool-Tech 34700Z recovers, recycles, evacuates, leak tests, and recharges R-134a quickly and accurately. 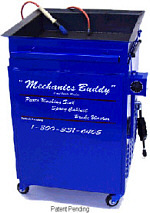 One pull of the handle activates the self-retracting 22-ton capacity ram. 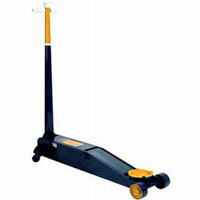 Long 49" T-handle for easy positioning under vehicles with long overhangs. Jack has large rubber-tired wheels. Lifting range: 8" min. height, max height 17" with adapter. Includes four adapters. Cylinder stroke is 4-3/4", PSI range is 90-145. With its low 8" minimum working height, and 53" handle, positioning is easy. extended; 13-1/8" max. height, screw retracted. 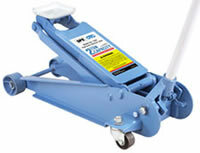 Maximum lifting height is 21" when using the optional No. 220972 three-inch lifting extension. Meets or exceeds ANSI PALD standards. With its 3-ton capacity and 24" of lift, the No. 1732 easily handles both SUVs and autos. The foam pad and 17-degree stop angle handle virtually eliminate damage to the vehicle. Features flanged edges, both top and bottom, to resist tipping. 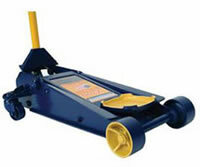 Sturdy 5/16" plate thickness ensures long life. 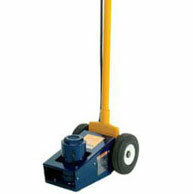 4-1/4" retracted height; 30-1/2" long chassis; 4-1/4" to 24" lifting range; 6-1/2" saddle diameter; 6-1/2" frame height. The strongest jack frame in its class; features flanged edges, both top and bottom, to resist twisting. 3-3/4" retracted height, 30" lg. chassis, and 48" lg. handle ensure this jack goes where you need it to go! 3-3/4" to 22-3/4" lifting range; 6" saddle dia. ; 27" overall reach; 6-1/2" frame height. Sealed cylinder prevents contamination of hydraulic system. Unsurpassed speed to load – extends to maximum height in just 3 strokes! 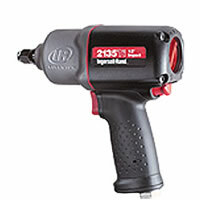 Fastest fully-loaded rise available – provides more than 1" of lift per stroke under maximum loading! 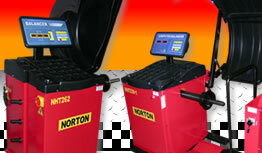 Widest lift range available – from 3-3/4" to 22-1/2". It even gets SUVs off the ground! Durable foam handle cover protects the vehicle from dents and scratches! Features a pinned saddle to prevent lift-off when removing load! 31" long frame reaches where you need it. Reduce tailpipe emissions by up to 70%, Increase Fuel economy up to 27% and restore output horsepower by up to 45%! Complete DeCarbonization and cleaning of Intake Valves, Injectors, Injector Screens, Fuel Rail, Air Intake Tract, Throttle Plate, Manifold Runners, Catalytic Converter, Exhaust Valves, Oxygen Sensors and EGR system. Built in diagnostic features – Fuel Volume, Fuel System Leakdown, Injector Flow, Fuel Pressure, Pressure Regulator, Pump & Vacuum System Tests. 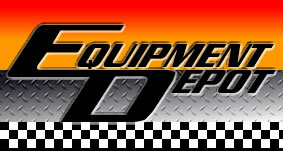 Extensively tested at General Motors Proving Ground Vehicle Laboratory USA! Effortlessly and Efficiently exchanges new fluid for used fluid. Exchanges used fluid from the Torque Converter, Pump, Pan, Cooler and Cooler Lines. Allows pan drop and filter change before or after fluid exchange. Allows evacuation of the transmission pan through the dipstick tube with the standard retrieval wand before the pan is dropped to prevent spillage when inspecting condition of the transmission without performing a fluid exchange. Refill the transmission pan through the dipstick tube after the pan is reinstalled with either new or used fluid. Quick indication of fluid flow for verifying proper hookup to perform the fluid exchange. Holds up to 20 quarts new fluid and 20 quarts used fluid. Exchanges the fluid through radiator cap, reservoir or upper radiator hose. No software or electrical components to breakdown. • Simple controls with function indicator lights that follow the job sequence. • Vacuum pump timer - 5 to 60 minutes. • 25 micron, 5 CFM high performance vacuum pump. • Automatic NCG detection and purge. • Compressor oil service port. • Analog hour meter to determine filter change intervals. • Easy "Spin On" filter change. • Programmable charging scale with .5 oz. resolution and heavy duty load cell. • Vapor and/or liquid recovery with single pass recycling. • Oil charge on vacuum side. • Ships complete with (1) 30 lb. (13.6 Kg.) dual valve storage tank and appropriate gauge set. 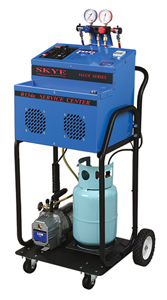 Flushes system with pulsating pressure at the master cylinder reservoir and vacuum at all four bleeders at once.